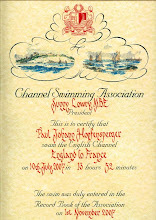 www.HoffySwims.com: Things you have to do in Dover when you've swum the Channel, and a big THANK YOU to everyone who helped me! Things you have to do in Dover when you've swum the Channel, and a big THANK YOU to everyone who helped me! Above: Thursday July 12, 2007. My Pilot Andy King and me look at the chart of my swim in our caravan at the Varne Ridge Holiday Park. Above: Saturday July 14, 2007. Me presenting the Channel General, Freda Streeter, with two small presents to say a big "Thank you" for all her efforts in helping to get me across the Channel. You'll have to ask her what we got her personally! Above: Saturday July 14, 2007. Martin from The Sandown, took Beccy and I for a "Pint or Two" at The White Horse in Dover. 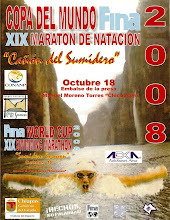 All successful swimmers are entitled to put their names and times on the wall. 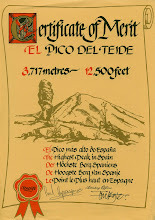 There were some very illustrious names up there. 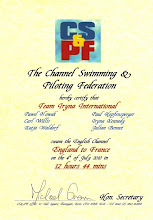 Mine is now next to Mike Cross's name who is now a two time channel swimmer. Well done Mike! Above: Sunday July 15, 2007. David and Evelyn at the Varne Ridge Holiday Park where we stayed during the swim week, always raise the national flag of a successful swimmer, and place their names and National flag on the wall. The above was taken the day we left to come back to Bury. As can be seen from above, it was all go for the days following the swim. Having got back to Bury late on Sunday July 15, 2007, one week later it still has not slowed down! Above: Beccy and Baz count the £138.35p sponsorship money collected in a 3 litre whisky bottle at the Rising Sun Pub in Bury St Edmunds. 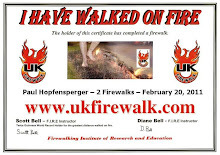 Thanks to Bob and Jan for a great effort! My wife Beccy, for spending so many weekends at the seaside for the best part of a year, and to being such an expert feeder on the day of the swim. My son Sebastian (Baz) who also spent many weekends, including a very cold Boxing Day in December 2006, helping me, encouraging me, shouting for me during swims and for just being there. Thanks Baz. 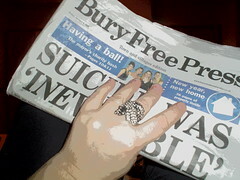 The Bury Free Press, for putting a monthly article in the paper, every month for 11 months! It has been fantastic coverage, and thanks to the Editor, Barry Peters, for this. Freda Streeter, for really making my weekends in Dover enjoyable, and for never ever letting me give up when sometimes you really want to. The bollockings have been legendary (see just one of them below)! Barrie the Shingle Stomper, Cliff Golding and the beach feeding team for constant encouragement, laughter and feeding us during all those 6 and 7 hours swims. You're commitment is unbelievable! Gudrun and Mark at The GeeCol Wellness Studio and Med & Mind for all the massages and Electro-Magnetic treatments to sooth my aching body! To Loraine Verghese for being my support swimmer. 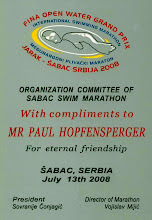 I am now looking forward to being your support swimmer at the end of August. BBC Radio Suffolk for their excellent radio coverage before, during and after the event. Thanks to reporter Jon Wright who came onboard ship and threw his guts up but still managed to broadcast all day! Well done Jon! To John Stemp, my coach. It brought us together again after a gap of about 23 years! It was good fun, and I hope you enjoyed it as much as I did. Thanks John. 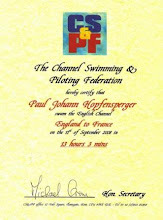 To Mike Read, 33 times channel swimmer, who inspired me to do this way back in 1980, and has encouraged me all year. To everyone who has sponsored me so far, and who will hopefully sponsor me in the near future - Don't stop I am still about £45,000 short of my target! I'm sorry if I've missed anyone. But thanks to you anyway if I have. Especially ike the bottom piccy of you and Freda!! I'll miss this blog - wonder what your next project will be??!! Hi Ruby - I haven't finished with this blog yet! Lots going on. 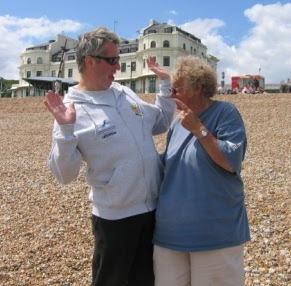 "On the sofa with Leslie Dolphin" next, followed by 2000 Metre swim on Dover Regatta Weekend, August 11, and supporting Loraine on her channel swim attemp in late August. Don't stop watching this blog yet please!